A monument commemorates 33 former scholars who died in service or were killed in action during World War One. 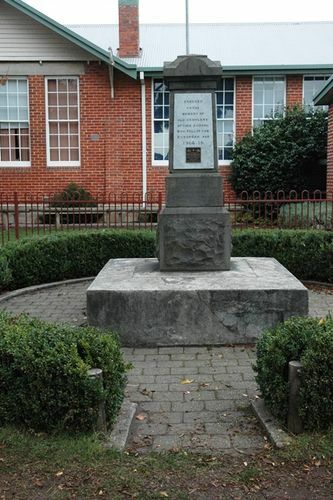 The memorial was erected by the Ulverstone Parents Association. His Excellency the Governor arrived in Ulverstone last evening at 6.30, and today he will be motored through a large stretch of our back country, visiting five state schools. On Wednesday forenoon a trip up the river will be made. In the early afternoon he will pay another visit to the local state school to lay a foundation stone to the War Memorial to the boys who have fallen at the war from this school. Examiner (Launceston), 17 December 1918. Erected to the memory of old scholars of this school who fell in the European War 1914 - 1918. In loving memory of Frank MacDonald M.M.